Java Wireless Mobile Shopping is an application which caters to browsing a shop or shopping mall right in your wireless device. Using the technology of WAP and MIDlets in the handheld device, combined with MySQL and a JSP/Servlet processing host, customers can create and retailers can process orders all from their handheld/handphone! Above you see the program in action in many of the various devices. 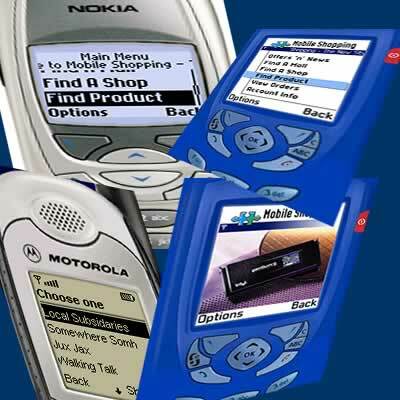 Emulators used above are the Nokia Series 60 Symbian OS in action, J2ME Emulator and the Nokia 6310. Updated code to work with newer emulators. Thanks to Kiruthika! FAQ page updated with checklist. Also the midlet download has been changed as the JAD file specified servers wrongly. Full source code added to download section. Download section added. You can now download the files! Some Screen Shots and FAQs added.